If you're a user of the new Mac Pro, chances are the machine is going to spend the majority of its time in one spot. However, if you need to move it from place to place on occasion—or even regularly—you're going to want to do so in a way that doesn't expose your Mac Pro to unnecessary risk. 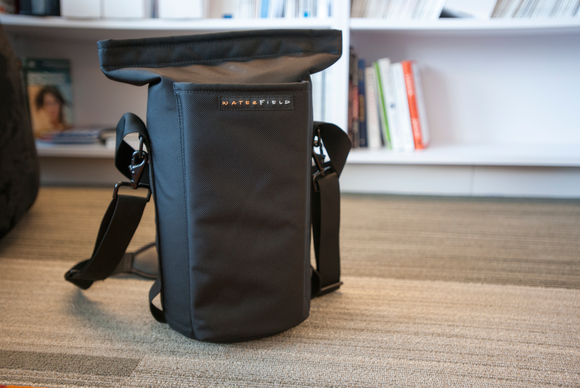 Sure, you can use the box it came in, but the Mac Pro Go Case from WaterField Designs is a more permanent and elegant solution. The Mac Pro Go Case can fold down pretty flat when you remove its rigid disks. The case is cylindrical in shape, but there aren't any fixed rigid parts so it can be collapsed pretty flat. The bag is held closed at the top by a strip of velcro. I would have prefered a zipper, but perhaps they're trying to keep scratchy metal away from your shiny Mac Pro. Apple's Wireless Bluetooth keyboard fits just right in the long pocket on the side of the Mac Pro Go Case. On the side of the Mac Pro Go Case is a long pocket that nicely fits an Apple Wireless Keyboard. The wired version on the other hand, which has a number pad and roomier directional keys, protrudes out the top of the pocket. Of course, the pocket can carry whatever you want, including non-Apple keyboards. The Mac Pro Go Case has a pocket to hold small or loose items, and stops debris from falling into the top of your Mac Pro. 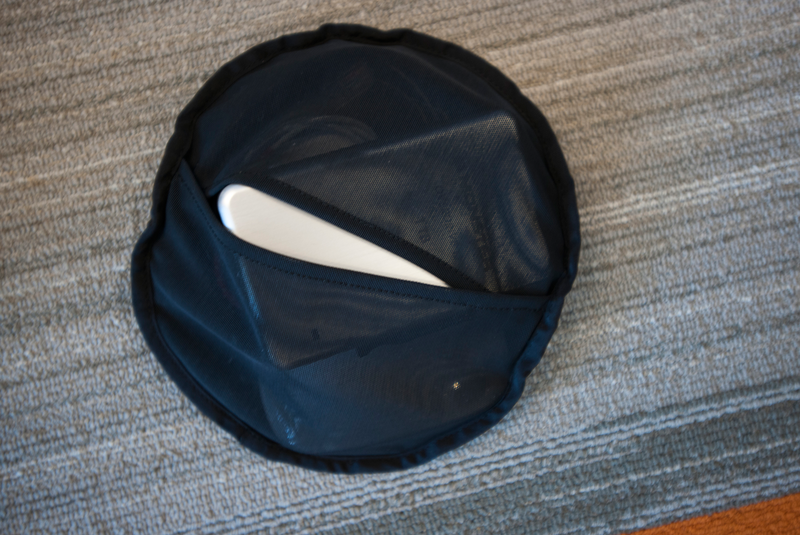 The inside of the Mac Pro Go Case is lined with a very soft plushy material. There are also two removable rigid disks: one sits on the bottom of the bag for a bit of extra protection when setting the case down. The other lays on top of the Mac Pro when it's inside the case, and has a pocket for holding accessories and small stuff that could fall into the top of your Mac Pro. 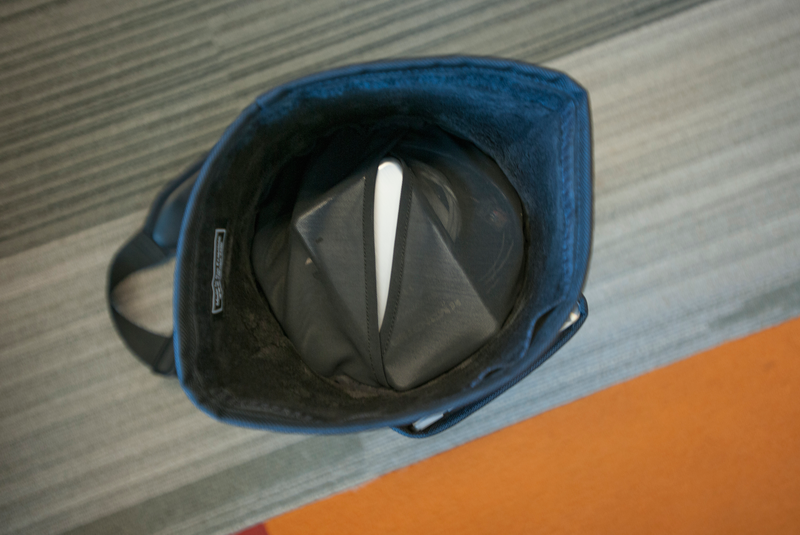 The pocket disk goes on top of the Mac Pro once it is safely in the bag. I put a Magic Mouse, portable drive, iPhone charger, and ethernet cable in the pouch. With that on top of the Mac Pro, I then put a USB SuperDrive on top of the pouch and closed up the bag, just barely. If I took out all the accessories and SuperDrive I could fit a Little Big Disk Thunderbolt 2 drive, along with its power brick and Thunderbolt cable in with the Mac Pro. 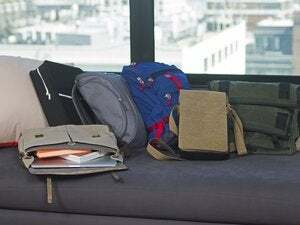 There is room for accessories, but nothing expansive. The Mac Pro Go Case stuffed with a Mac Pro and accessories, including an external drive and keyboard/mouse combo. 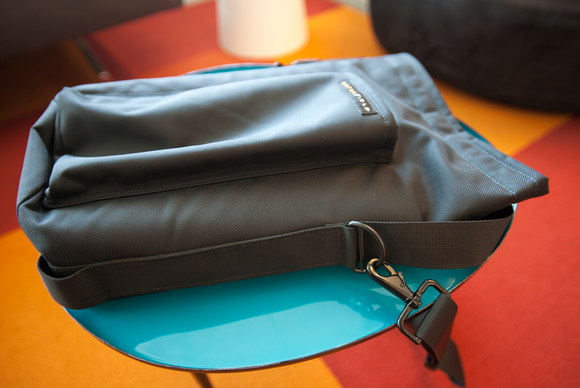 The Mac Pro Go Case has both a short carrying handle and a removable shoulder strap. 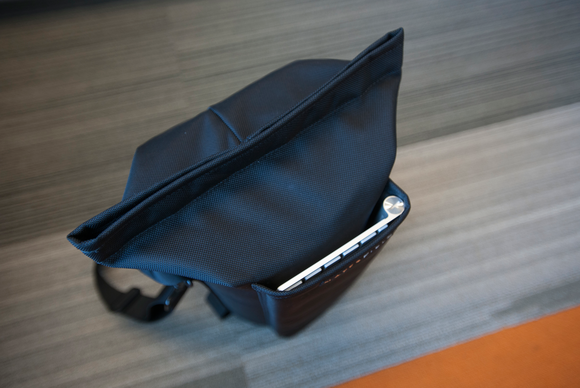 At the bottom of the bag are two small loops you can hold while you yank your Mac Pro out of the bag. The outer casing of the Mac Pro Go Case is made of ballistic nylon and WaterField claims the bag is water resistant. That means with some light water and you'll probably be fine, but think twice before you trudge through a rain storm. 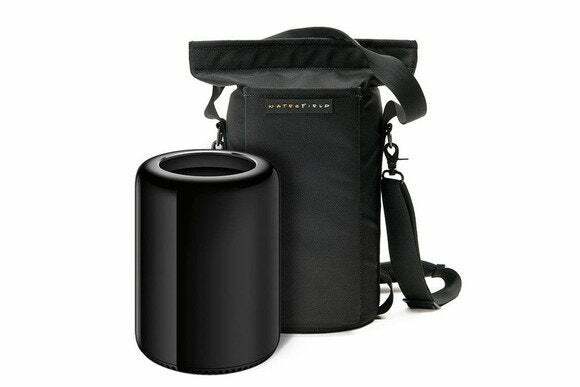 The Mac Pro Go Case is a great accessory for anybody looking to regularly transport a Mac Pro. If you're perfuming a one time move, you can use the box your Mac Pro came in, or just wrap it in bubble wrap and blankets . The Mac Pro Go Case is a nice way to transport your mac pro without having to reuse the box it came in.